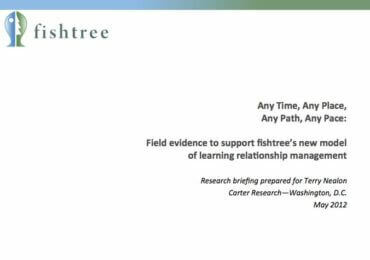 Fishtree Inc. is a privately held Educational technology company that provides a dynamic, web-based platform enabling Personalized learning at scale for K–12 and Higher education. Helped the company founders first articulate an entirely new approach to personalized learning now broadly known as Learning Relationship Management (LRM) software. Carter Research isolated for the development team the four-part framework of social, mobile, currated, and adaptive content upon which the Fishtree solution hangs today. We have not yet begun to see the cost-reduction, quality improvement, or outcomes enhancing effects of technology-enabled learning on the delivery of K-12 education as we should have. Literally hundreds of edtech start-ups as well as more mature and more proven companies—some with exequisite learning solutions—languish under the burden of education’s failed market dynamics.